There are a variety of different ways to connect at The Orchard. Check out just a few of our ministries below. The Orchard is committed to the family, and that means we're committed to kids. Our purpose is to connect people, so that together we can learn more about God. Kids need this just as much, if not more, than adults. The Treehouse Club currently serves children from birth through 8th grade. Our staffed nursery is available on Sunday mornings from 15 minutes prior to the start of each service until 15 minutes after the conclusion of the service. Other grades will be dismissed to their classrooms mid-way through the worship service. To learn more about our curriculum, please click here. To download the weekly Family Plan please click LINK. 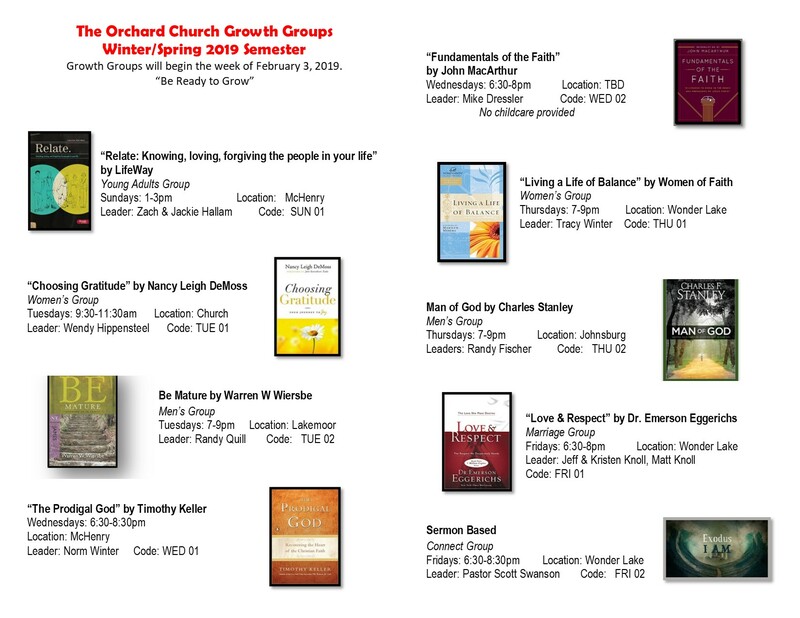 These are our small group Bible studies at The Orchard. Groups meet each week in homes or at the church. Click on this LINK to see this sessions offerings. Register for a Group Now! You may do this by either signing up on your Sunday communication card or contacting the church office at info@orchardmchenry.org. At The Orchard our Junior High and Senior High students have the opportunity to connect together each week for fun, encouragement and a challenging time of learning. OZONE meets every Wednesday @ 6:30pm! Orchard U is for those who want to dig deeper. These classes include reading assignments, tests and other homework and include subjects like Systematic Theology, Understanding Islam and ministering to Muslims and Church History. Details for next semester will come out in the late Spring of 2018. The Orchard provides opportunities for women to connect with one another and grow in their walk with Christ. From small group studies and one-on-one discipleship to fun lunches and outings and retreats. If you are retired or nearing retirement you'll enjoy connecting with others in the same life season. Learn more.